New York SCBWI Winter Conference… Wow. Unfortunately, I didn’t take an photos at the sessions last week. Probably because I was too busy taking notes or flapping my gums. I think these photos sum up the weekend nicely though. New York… wow. I get it now. For the past week, I have been literally CHEWING on all the wonderful information that was thrown at me during the SCBWI conference in New York City. I was expecting a great event, but I had no idea how inspiring it would truly be. Towards the end of the conference the common question among attendees was “What was your favorite part?” I would have to say that it is difficult to put into words. Mainly, I was amazed by how many of my peers were having lightbulb moments of inspiration. They happened during sessions, over dinner conversation, while taking breaks and late at night in the hotel bar. You could always tell when it happened… the person would stop, grab their pencil and feverishly begin taking notes or sketching. I personally worked through a problem I was having with a manuscript during one session. I came up with two new picture book ideas. Another friend wrote an entire picture book draft in the midst of a keynote. I think one of the greatest gifts when attending an SCBWI conference is allowing yourself to forget your daily life and immerse yourself in your passion. The second gift is that you are able to do so surrounded by like-minded people. These people don’t bat an eyelash when you begin discussing treasure ships, talking chickens and “Robo-vampires set on destroying the earth” (Yes… for those who didn’t attend, this was an actual topic of discussion on one of the panels). They share in your enthusiasm when you talk about your new Wacom tablet, your trials and tribulations with XYZ printing company, and your frustrations about working while a toddler hangs off your arm begging for more apple juice. It’s just nice to know that we aren’t alone. Overall, I feel envigorated, renewed and full of direction. MUCH more so than when I packed my bags and headed to the airport a week ago. Obviously you can’t discount the experience of rubbing elbows and absorbing the advice of “the greats” in the business either. It amazed me how willingly people like Jane Yolen, Peter Brown, John Rocco, Cassandra Clare, Sophie Blackall, etc. were to share their knowledge and experience with those just getting started. They had a certain way of making you feel “invited to the party”… and party we did! The gala’s and socials were incredible and I met several people who I believe will be lifelong friends. Building a network is so important in this business (as many of the speakers agreed) and I feel great knowing that my own group of peers is growing with each new event. Many of you are probably wondering about all the “secrets and insider tips” we learned at the conference. Those that will help us to soar above the rest and land those coveted contracts. Most of all I learned that even the “professionals” are still stumbling along trying to find their way with each change in the market. It’s reassuring to know that they don’t have all the answers either. Be visible. Blog once a week. Comment on other people’s blogs… generally they will return the favor. Join Facebook and try to be interesting. Show the publishing industry that you are relevant. Just put your work out there. Key word: Discoverability. Do what you know and create what you love. If you are passionate about what you are doing it will shine through in your work. Give freely. Be generous and open. More ideas will come. Be an idea factory. Tell the truth in your character’s own language. The truth that you know is the one that will get you published. Look within, be honest and create from the heart. Read. If you want to be a creator of stories you have to know a lot about the world… and how to ask the right questions. Have style. Your own style has a relationship to your childhood and your own relationship with books. Don’t follow trends, do what comes naturally. Move from conscious creation to a more intuitive approach. Know your characters. The story of your book is found in whatever they NEED! Live a creative life. All the parts of your life inform one another. Even making cupcakes for your kids can feed your work. Stay strong. Success is directly proportional to your ability to accept rejection. Network. Connect with people who embrace your work. There was a lot of other discussion about websites to check out, the current status of the industry, suggestions for submission, marketing recommendations and more. I can’t even begin to go into all of those things just yet, but in the end those things are probably the least important. It all begins and ends with doing good work. I truly believe that if you have a good story, if you tell it well, if you create it with passion, and if you pursue its publication with a strong belief in its success… it will find an audience. I have to believe that. This belief has lit a fire under me this week and I look forward to seeing where it takes me over the next few months. Finally, I will leave you with the book trailer that John Rocco created for his book “Blackout”. Discussions on book trailers and marketing were a huge part of the conference and I was incredibly inspired by the passion behind this one. It doesn’t always have to be complicated. Sometimes simple can be wonderful. Three weeks ago I spent a very memorable weekend in Decatur, GA. I flew out for the Southern Breeze SCBWI Illustrator’s Day and it was an even better trip than I expected it to be. The speakers and mentors at this event were excellent and I found it very refreshing to be surrounded by illustrators again… something I haven’t had since I graduated. The speakers at the event included keynote Kristen Nobles, Art Director for Candlewick Press; Robert Agis, Editor from Sterling Children’s Books; Mike Lowery, illustrator and professor of illustration from SCAD; along with author Laura Murray. The event was very casual and I gained a lot of insight from what they had to say. Robert shared a lot about the illustrator selection process he goes through as an editor. He offered insight into ways that illustrators can make their portfolio and marketing materials stand out “in the crowd”… a lesson I will find to be invaluable as I move forward. Mike and Laura spoke firsthand about their experiences creating their book… THE GINGERBREAD MAN LOOSE IN SCHOOL (a WONDERFUL story!) Finally, Kristen inspired everyone in the room with her presentation on “giving glory” to your work. She reminded us all that picture books are made of magic… and we need to keep that in mind as we develop the emotions and characters in our work. After the presentations were done, the group went to another room where everyone received a 5-minute portfolio critique from the speakers. This was probably the most beneficial part of my weekend as I learned quickly what kind of first impression my portfolio is making to those in the business. They seemed pleased with what I had brought and most of their recommendations just revolved around diversifying what I am doing. Kristen mentioned that she would like to see me do a few images that are more “simple” to show that I am capable of showing the rise and fall of a book (citing all the detail in my work). Robert suggested doing a few peices which push perspective a bit more… pointing out that a lot of my images seem as if they are actors on the stage. His advice was basically to “make my audience a character in the story” and consider all angles to approach it before showing everything head on. All of them were drawn to my Little Red Riding Hood peice and they encouraged me to do more peices in that “darker” style. Overall I felt that they offered a lot of insight and I look forward to considering their advice as I move on to new pieces. That afternoon everyone that participated in the mentorship shared their work and talked about their process with Michael Austin. It was VERY interesting to see how differently everyone handled the topic and to learn what challenges they faced in their own work. Overall, the conference was wonderful and I hope to go to more Southern Breeze events in the future. Probably the one thing that really resonated with me the whole day was a statement that Robert made. He said to stop working on your portfolio and start promoting your work. He said “even if you just have one good illustration to put on a postcard and a website… do it.” He explained that an artist is never totally happy with their work and you could spend years perfecting. On the other hand… if you share one great piece of work with the right person it could lead to a job. The rest of the weekend, I spent at the Decatur Book Festival which happened to be going on at the same time. I really lucked out when Laura Murray offered me her tickets to the (sold out) keynote she couldn’t attend. Colin Meloy (author and lead singer of THE DECEMBERISTS) and his wife Carson Ellis (illustrator) spoke that night about their young-adult novel WILDWOOD, which was released last month. Hearing about their collaborative process on the book was amazing and since getting my (signed!) copy I can’t put it down. Beautifully written and beautifully illustrated… Wildwood is definately a work of art. Read it and you will see. I spent the remainder of the weekend touring the booths at the fair, buying way too much, and talking to a lot of wonderful people. I had the opportunity to meet several small publishers, a few more illustrators, a handful of authors, and dozens of interested (and interesting) readers. Before I headed out I even had the chance (after waiting in line with all the little fans) to meet author/illustrator Judy Schachner of SKIPPYJON JONES fame. If you haven’t heard of her books you should go check them out. They are soooo much fun… and so is she! 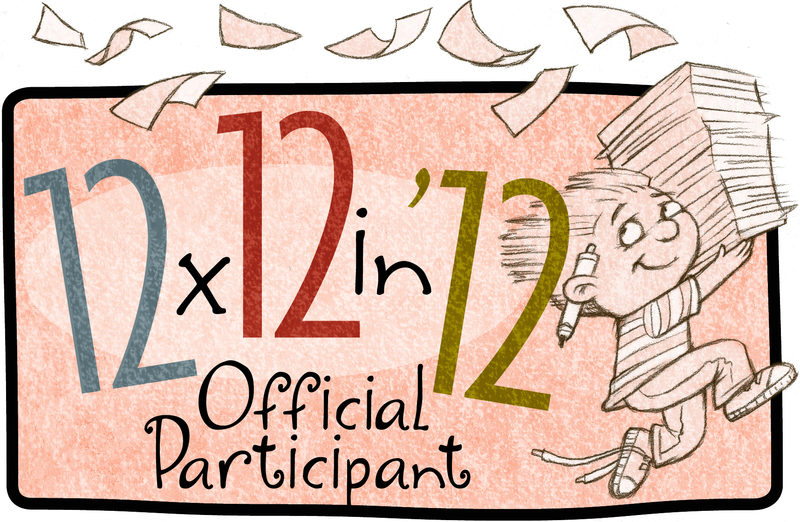 Next week I will be headed off to the Kansas SCBWI’s “Lights, Camera, Action… It’s SHOWTIME!” event. With a name like that, it’s sure to be a great conference! AND A SPECIAL THANKS TO JO KITTINGER (www.jokittinger.com) AND DONNA BOWMAN (www.InNaturesImage.org) FOR SHARING THE CONFERENCE PHOTOS ABOVE! Recently, I had the wonderful opportunity of completing a mentorship under illustrator Michael Austin. In advance of the recent SCBWI Southern Breeze Illustrators Day, I was given the challenge to create an image based on the theme, “Launch”. Throughout the illustration process, we were encouraged to communicate with Michael to discuss our concepts, sketches, execution and presentation. The advice he offered was very helpful and I expect that I will apply a lot of what I learned to future work. Upon hearing the theme, I began brainstorming concepts. Several of my ideas included images of food fights, rockets, etc. As I was sketching, my son Collin was playing in the living room. His new favorite game is to build towers and knock them down… he gets a thrill out of making a mess. Watching him led to the idea of a boy “launching” himself into a block tower. After thinking about the concept for a day or so, a scene of sibling rivalry between a young girl and her brother began to emerge. I decided that the girl had meticulously built a tower out of blocks and her brother has decided to “launch” himself into it… sending blocks flying in all directions. Michael’s initial advice was to continually focus on three elements which lead to a successful children’s book illustration… EMOTION, ACTION and CONNECTEDNESS. I asked him to clarify his definition of connectedness and he described it as finding ways to “tie your characters, objects and setting together so everything relates and works as one.” I posted these three words in my studio and I’ve tried to continually think about them as I work. Michael also encouraged me to give some thought to the “what happens next” factor… or COMMUNICATION. He explained that it is important to know what just happened in the scene… as well as what is about to happen next. Successfully telling this story will make your reader want to continue turning the pages. His first thought was that the girl may look a bit older than a child of a “block-playing” age… and explained that my choices with her pose and clothing could help with this. He recommended enlarging her forehead, as that area is proportionately larger in small children than it is in adults. He also suggested that I play around with softening the lines of her nose a bit, in an effort to make her appear younger. Next, he shared that while he loved the choice of clothing and expression in the boy, he felt that I might be missing a tie in with the “monster theme”. Upon seeing my initial sketches, he had thought about the old Superman line, “Able to leap tall buildings in a single bound.” He advised me to carefully consider my concept as I developed my setting in an effort to explain the boy’s motivation. Is he emulating his hero… or just tormenting his sister? Or both? To furthur develop the story, Michael suggested that I also give some thought to the girl’s movement and emotion. Is she afraid? Is she fighting mad? Is she playing along as the superhero’s nemesis? Michael explained that the information read from her should work to add to the story. Finally, he encouraged me to consider other factors like setting, unique lighting effects, secondary characters (like pets or parents), color palette and the perspective by which the scene is being viewed. Our discussions led to many options for development and he emphasized that the decisions were mine to make. This conversation really opened my mind to the idea that concept development is truly a journey taken by the artist. I am definately looking forward to taking this thought process forward into future illustrations.